It is Henri de Londeres, Archbishop of Dublin, who is credited with the castle’s design. It was situated in an elevated position overlooking the city at the junction of the River Liffey and its tributary the Poddle. The castle was enclosed by four thick walls with a circular tower at each corner, and surrounded by a very wide moat. Improvements were made to the castle in 1660 however many of this were destroyed by a fire in 1684. The only remaining portion of the original castle is the Record Tower. 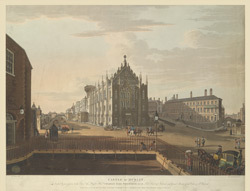 In the centre of this picture is the New Castle Chapel, to the right is the Treasury and to the left is the entrance to the Ordnance office.